SweetPro’s Bruiser remains in control of the World Champion Bull hunt after a 44.75-point score in Round 2 of the PBR World Finals. Photo: Andy Watson/BullStockMedia.com. LAS VEGAS – SweetPro’s Bruiser may have picked up the lowest bull score among the top three contenders for the 2018 World Champion Bull title Thursday night, but the reigning World Champion is still in control of his destiny. Bruiser bucked off Francisco Garcia Torres in 3.35 seconds for a 44.75-point bull score in Round 2 of the 2018 PBR World Finals, which lowered his World Champion Bull average to 46.11 points. However, Smooth Operator and Spotted Demon were unable to pick up large scores Thursday to really chip away the reigning champ’s commanding lead. 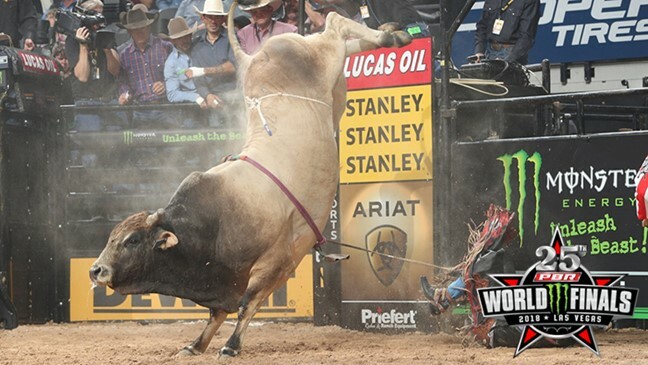 Spotted Demon was the top-marked bull of the three contenders with his 45.75 points he received from teaming up with Marco Eguchi for a 94-point ride. The 10-year-old bull raised his World Champion average to 45.14 points. Smooth Operator did his job by dispatching Fabiano Vieira in 6.2 seconds, but he only was scored 45.5 points and saw his World Champion average drop to 45.61. Therefore, Bruiser can clinch a record-tying third consecutive World Championship on Sunday at T-Mobile Arena by scoring higher than 45.5 points in the championship round. Little Yellow Jacket and Bushwacker are the only bulls with three world titles in PBR history. Little Yellow Jacket won three straight, whereas Bushwacker’s three titles were interrupted by Asteroid in 2012. If Bruiser were to hip himself or be called for a foul on Sunday, then that could potentially open the door for the other challengers, especially if he is marked below 40 points. Stock Contractor Julio Moreno admitted before Round 2 on RidePass that it is going to take some luck to take down the legendary Bruiser, regardless of the fact that Bruiser has been out of commission for the last four months. “Yeah, we are the underdogs, but I’m just hoping (Spotted Demon) has those outs he’s been having lately and go on and do good,” Moreno said. In the race for Bull of the Finals, which is different from the World Champion Bull contest, Legit is in the lead following an impressive 46-point bull score. Legit bucked off Luis Blanco in 2.36 seconds in Round 2. Blanco was shocked over how strong Legit ended up being. Blanco felt Legit take away the power in his legs.